While some people fail to recognize irony, others truly appreciate its presence. 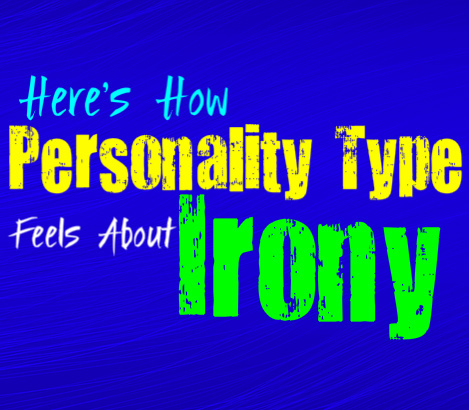 Here is how each personality feels about irony. INFJs have a definite appreciation for irony, in all of its forms. They love anything that helps to stretch their minds and challenge their way of thinking. They have such active inner minds, and are always mulling over a million different thoughts and ideas. INFJs enjoy when certain things are used for humorous result. Especially when they can recognize it, where some others might be completely unaware. Irony is rarely lost on the INFJ, since they are alert to this type of delivery, and enjoy an abundance of sarcasm and satire in their lives. ENFJs definitely appreciate irony, and do not struggle to recognize it. While some people might be blind to its existence, the ENFJ recognizes it for what it is. They enjoy literature, and appreciate a sense of dramatic irony in certain stories. They often are aware that irony can be used to express a great many things, and enjoy being able to take notice of it. ENFJs are not the type of people to miss irony or sarcasm, and are naturally in tune with those sorts of things. While some people simply see what is on the surface, the ENFJ looks deeper. INFPs are not blind to irony, and are capable of recognizing it. They are constantly searching for a deeper meaning in things, which makes them appreciate the usage of irony. Instead of just looking at the surface, the INFP wants to be able to understand something on a more intense level. They do enjoy the use of irony, especially when it is done in a somewhat dark way. INFPs are intelligent people, who often love to soak up literature and appreciate the many different effects of irony. ENFPs have an appreciation and recognition for irony, since they do enjoy looking at the deeper meaning of things. In some cases the ENFP might find it unsettling, especially if the irony hits them in a personal way. They enjoy literature and things that challenge them, and are constantly pushing to grow. The ENFPs naturally attraction towards theatrics and sarcasm, often makes them enjoy certain elements of irony. Being able to dig a little deeper in order to fully appreciate something, often makes the ENFP rather intrigued and inspired. They dislike anything boring or flat, which makes them search for excitement. INTJs can often have a very dark and ironic sense of humor, which can surprise some people. They enjoy being able to observe a deeper meaning in things, and thrive when they feel challenged. They love being able to push themselves and are always searching for a way to learn and grow. Irony is intriguing for INTJs, since it possess a somewhat cynical and even dark quality in many cases. They enjoy being able to observe things, and pull out the most interesting meaning behind it. INTJs rarely miss the presence of irony, even in their daily lives, and enjoy being able to perceive it. ENTJs value efficiency, which can cause them to prefer remaining focused on what needs to be done. While ENTJs are hardworking and focused people, they also have a more playful side to their personality. The ENTJ wants to get things done when they are in work mode, but knows how to appreciate things in life. They enjoy pushing themselves to grow and absolutely love feelings challenged. ENTJs often appreciate irony, and are somewhat sarcastic individuals. They can recognize things on a deeper level, and don’t just take life for face value. INTPs are complex people, with incredibly rich and active inner minds. They enjoy diving deeper into the meaning behind things, and often appreciate irony. INTPs are always looking to challenge themselves, and have incredibly analytical minds. Irony is not just something you can simply take for face value, and requires a little more thought- this makes the INTP rather intrigued. They can appreciate the darker side of things, and enjoy a little irony for dramatic result. They are sharp people, who enjoy feeling challenged and love being able to pick things apart and analyze them. ENTPs hate staying stagnant, and are very imaginative and curious people. Their desire to constantly grow and learn, causes them to be interested in a wide variety of things. While irony can make some people uneasy, ENTPs have a great appreciation for it. They realize it can be used to convey a certain point, or simply utilized as a comedic tool. ENTPs enjoy being able to approach things from a different perspective, and often are very sarcastic and somewhat ironic people. They also enjoy satire quite a bit, and love anything that pushed and challenged their minds. ISTJs are internally focused people, which means they often enjoy literature and anything that can help them be more introspective. While ISTJs are usually sarcastic people who can appreciate irony, they don’t spend much energy obsessing over it. They prefer being pragmatic and often focus on getting things done. ISTJs have high standards for themselves, and are constantly pushing forward in life. They often enjoy elements of irony, especially when they can absorb it in their spare time. Anything that pulls ISTJs away from being efficient and upfront, can bug them a bit though. ESTJs are practical people, who prefer to focus on what they can change. They don’t want to waste their energy on searching for the deeper meaning, and appreciate things that are upfront. ESTJs value efficiency, and simply want to be capable of getting things done properly. While they are often intelligent people, they just don’t feel the need to focus on certain literary elements such as irony. These things can really only hinder their ability to be effective in their work, and likely means very little for the ESTJ. ISFJs rarely care for the effect of irony, and prefer things to be more upfront. They are mainly focused on caring for their loved ones and don’t want anything to get in the way of that. Having to dig deeper to appreciate something is only a waste of time and a bit exhausting for the ISFJ. They are often capable of recognizing irony, they just rarely care all that much for it. They realize that sarcasm and irony can actually be dark sometimes, and might even hurt people. They would rather be compassionate and sensitive, than harsh and tactless. ESFJs often do enjoy literature, and might appreciate irony in some forms. While the ESFJ is not incapable of recognizing irony and sarcasm, sometimes it can bother them. They don’t mind digging a little deeper, but at the same time they don’t want to focus on anything too dark. ESFJs have their own personal interests, which can sometimes be different than their primary focuses. The most important thing to the ESFJ is caring for their loved ones and striving to make them happy. ESFJs do appreciate irony, especially in literature or film. ISTPs certainly don’t mind the presence of irony, and are highly capable of appreciating it. They enjoy being able to recognize it and look deeper into things. While ISTPs are analytical people, who thrive when they can challenge and push themselves. They don’t want to remain stagnant and can become bored rather easily. They often appreciate the use of irony in storylines, because it can help push their minds to observe things on a deeper level instead of just taking it for face value. ISTPs simply want their lives to be exciting, and hate feeling like they are stuck in one place. ESTPs are intelligent people who enjoy challenging themselves in many ways. They often have an appreciation for literature, as well as the presence of irony. They can recognize sarcasm and things that possess a deeper meaning, especially when it comes from something that intrigues them. ESTPs don’t mind a little darkness, and won’t become upset by irony at all. Especially if it is something that pushes them and keeps them interested. ESTPs simply dislike being bored, and don’t want to live stagnant lives. ISFPs are not usually fans of irony, especially when it comes to the darker side of it. They prefer to be upfront and sincere about things, and dislike having to search for a double meaning. Sarcasm can sometimes upset ISFPs, since it often hurts people with its sharpness. ISFPs enjoy focusing on positive things, and simply want to enjoy the present moment. They also dislike seeing pain in the world around them, and don’t want to become obsessed with those saddening thoughts. ESFPs rarely have an appreciation for irony, and might miss it entirely. They aren’t always capable of recognizing sarcasm, since ESFPs prefer to be upfront about things. Having to search for a deeper meaning can actually frustrate and even upset the ESFP. They don’t enjoy things that aren’t clear, and may feel like it is insincere to be that way. ESFPs enjoy being able to live life in the present moment, without having to obsess over reading into things. Irony can be missed on them, and sometimes even a bit bothersome.